Copyright © Stacy Claire Boyd. Images used with permission. 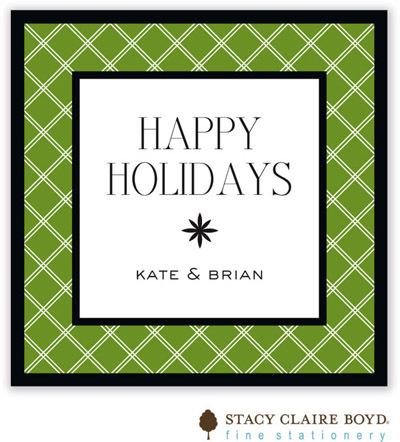 Flat calling card with holiday theme. You specify all the text to be printed in your choice of ink color and typestyle. You can also add an optional motif for no additional fee. Due to its small size, these cards are not suitable for mailing. Edward and George shown. Choose up to 2 of any of our available typestyles and dictate where they are used. Licorice shown. Choose up to 2 of any of our available ink colors and dictate where they are used. Motif #SI095 shown. You have the ability to customize your product by including any of the available motifs. White calling card envelopes available for an additional fee. If using, where should Typestyle #2 be used? If using, where should Ink Color #2 be used? Do you want any envelopes?